A call to CSO Yachts confirms a further €295,000 price reduction on Claude Niek’s central listing, the 27m Leopard motor yacht Romachris II. 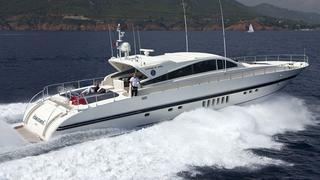 Delivered by Italy’s Arno yard in 2001, she accommodates eight guests in two double and two twin staterooms, while twin 1826hp MTU engines give her a cruising speed of 28 knots. Lying in La Napoule, France, Romachris II is down from €1.29 million to €995,000.